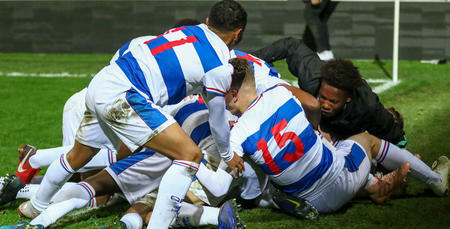 RANGERS’ Under-18s are into the fourth round of the FA Youth Cup following an evening of real drama at Loftus Road. Florian Yonsian’s 21st-minute effort for the visitors looked to have handed Rochdale a 1-0 victory in W12. But QPR produced an unlikely equaliser deep into second-half stoppage time through substitute Dejarhn Grant – before a thrilling period of extra-time ensued. Dale made it 2-1 through skipper James Neild in the 107th minute, then R’s goals in minutes 109 and 115 handed Paul Furlong’s youngsters the tie. Sub Armelindo Mema finished off a slick home move, before Nathan Carlyle sparked wild scenes of celebration with his thumping Rangers third. The first chance of the match went QPR’s way. Khaliq Raymond-Callender showed good strength down the right wing and crossed for Jake Frailing, who diverted his shot just over the crossbar. In the 12th minute, Rochdale fashioned a decent opening when the lively Fabio Tavares was played through on goal, but Tyla Dickinson in the R’s goal produced a fine low save. Dale were the quicker of the two teams to settle and almost opened the scoring in the 20th minute when Florent Hoti found Tavares with a clever ball, but again Dickinson was equal to his left-footed drive. And a minute later, the visitors took a deserved lead. 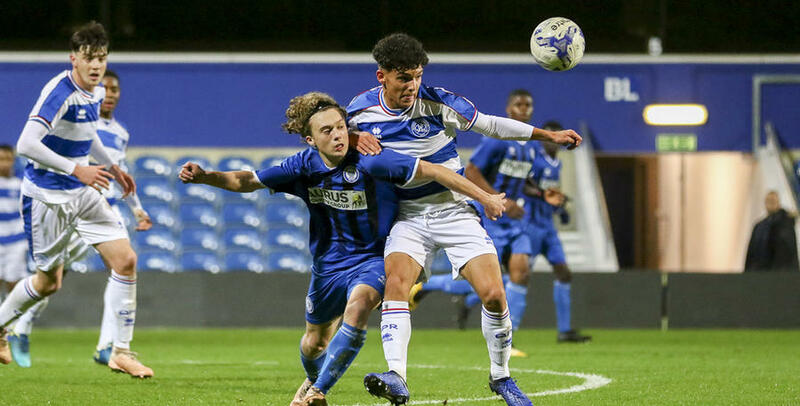 A loose ball in the QPR midfield was picked up by Lewis Bradley, who advanced across the Loftus Road turf and fed Yonsian. The latter then calmly tucked the ball into the far corner. Rangers seemed to relax a little after going behind and enjoyed some decent possession, although the chances were all falling the way of Rochdale. In the 36th minute, patient build-up play from Dale led to Bradley curling a 25-yard effort fractionally over. Dickinson was again called into action two minutes before the half-time whistle, palming away a Bradley header at close range. QPR needed a quick start to the second period and nearly levelled when Marcus Brooks brilliantly skipped past his man on the right-hand side, then played a teasing cross that just evaded Raymond-Callender at the back post. Rangers almost levelled again just before the hour mark. The ball was played into Bunmi Babajide, who neatly held off his man before Frailing's first-time effort fizzed just over the bar. With 28 minutes to play, R’s boss Furlong made his first two subs of the game. Babajide and Raymond-Callender were replaced by Dillon De Silva and Mema. In the 68th minute, Dale almost got a second goal in spectacular fashion. From 35-yards out, Louis White decided to try his luck at goal and was so unlucky to see his shot bounce off the upright and safely into the hands of Dickinson. The game was beginning to open up and it was QPR’s turn to threaten next. Substitute De Silva weaved in and out down the left before cutting in and forcing Morgan Piper into a low save, with Brooks somehow diverting the rebound wide. Grant then came on for Kayden Williams-Lowe, as the R’s looked to push forward for the final 10 minutes of normal time. The R’s huffed and puffed but, in truth, looked to be heading out of the competition when three minutes were added on at the end. However, deep into stoppage time, Rangers forced extra time! A goalmouth scramble occurred in the visitors’ box and, when the ball arrowed kindly into the path of sub Grant, he hammered home a low effort from eight yards. Into extra time, then, and in the 96th minute, Mema’s 12-yard effort on the turn for the R’s only just dropped over. Rangers posed the greater attacking threat in the first half of extra time and, in the 105th minute, Frailing and De Silva both went close with separate attempts. However, it was Rochdale who struck the first blow after half-time of the additional 30 minutes. White’s right-wing corner was to a tee for visiting captain Neild, who thumped his close-range volley past Dickinson to make it 2-1 on 107 minutes. But the drama wasn’t done there and, only two minutes later, the R’s responded once again to level matters. The best passing move of the night was finished off by Mema, who exchanged passes with Grant before finishing expertly from 10 yards. 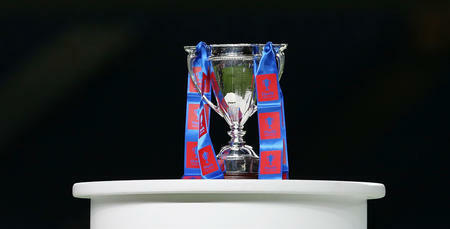 Rangers then completed the comeback and their route into round four in the 115th minute. Frailing burst into the Rochdale penalty area with an industrious run before cutting the ball back for Carlyle, whose bullet 12-yard shot darted into the top left-hand corner. QPR could even have added a fourth goal thereafter, but Brooks blazed over when put clean through on goal. Three-two to the Super Hoops. QPR: Dickinson, Williams-Lowe (Grant 78), Woollard-Innocent (Mahorn 101), Drewe, Carlyle, Gubbins, Raymond-Callender (De Silva 63), Remy, Babajide (Mema 63), Frailing, Brooks. 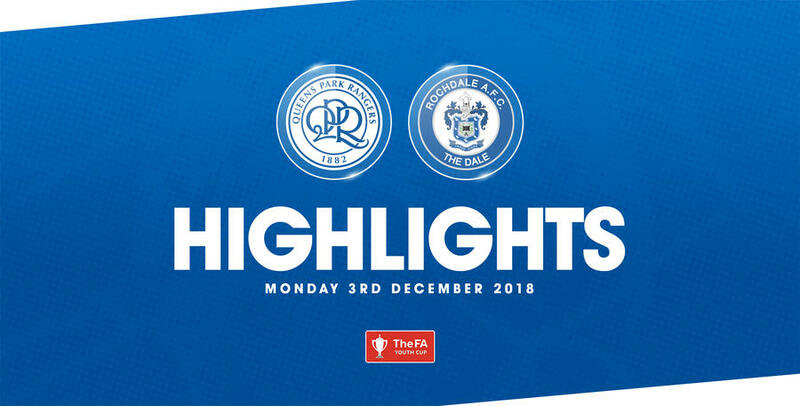 WATCH highlights from QPR Under-18s FA Youth Cup match against Rochdale at Loftus Road.